What are the ingredients that deliver value? 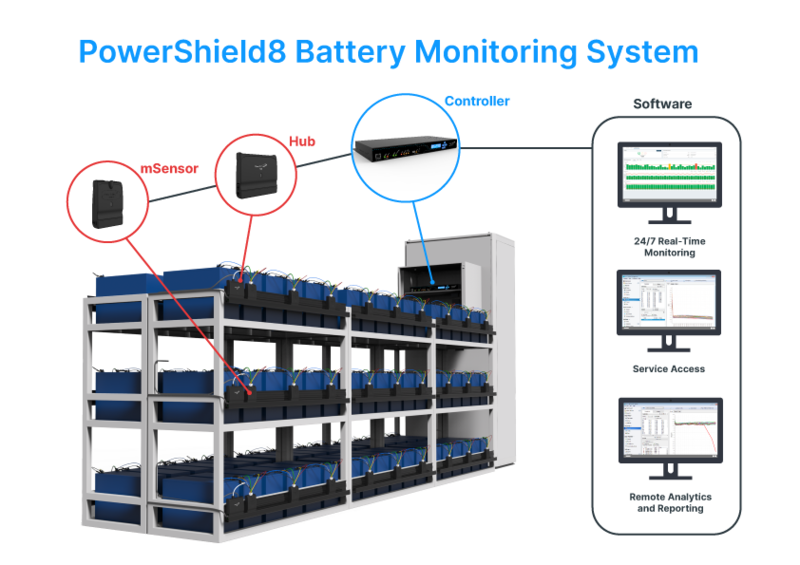 PowerShield battery management systems use a modular approach to combine accuracy and safety with ease of installation. With options for VRLA, VLA and Ni-Cd cells, an enterprise level software package and a range of communication choices, PowerShield can provide solutions tailored to exactly match your batteries. PowerShield sensors feature advanced circuits that drive fast data sampling and powerful measurement algorithms. The Controller monitors, collects, interprets and stores data from the battery and string-based sensors. The Controller is a stand-alone unit that functions without the need for PC control and is suited to both online and offline applications. A Controller can accommodate up to 512 individual batteries and 10 years of data points. Whether running as a stand-alone system or integrating with existing facility management systems, PowerShield offers a range of simple solutions to help you stay informed. Link battery management software brings your batteries to your desktop via the LAN. Email alerts can be sent direct to your service team. A range of communication options mean that solutions can be tailored to meet your monitoring and reporting needs. An enterprise level, Windows based package, Link software enables multiple users to access the same data simultaneously. Link software gives your staff the reporting tools to analyse trends, identify potential battery failures and help you to identify and manage battery end-of-life. If you’d prefer an independent or external view on your battery data – or simply a second opinion – the PowerShield Reporting Service is a cost-effective way to receive expert analysis and interpretation of your battery data. Talk to your PowerShield representative about our monthly Reporting Service which provides expert analysis of your battery monitoring data. Complete awareness of the overall condition of your batteries. Assurance any battery issues will be identified to enable a timely response. Reduce the internal effort required for monitoring battery performance data.